There are many departures a day for the ferry from Langkawi to Kuala Kedah on the Malaysian mainland and the journey is scheduled to take just one hour 45 minutes by high-speed boats. The ferry service operates every day of the year and departs from Kuah Jetty (the main town on the island). The ferry to K. Kedah is just one of a number of boat services to the mainland and Thailand. (04) - 966 5889 or 966 5131. 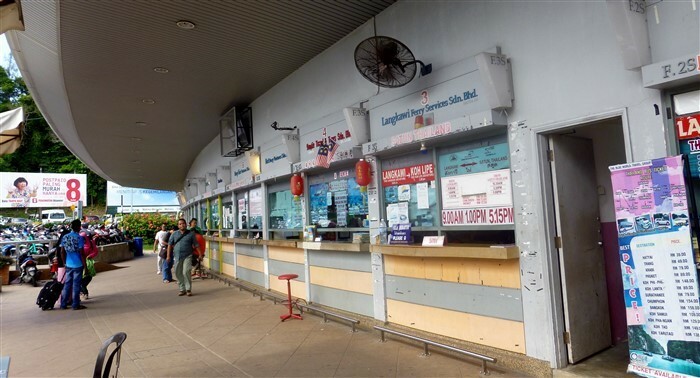 Tickets can be bought from either the Kuah jetty ticket counter or from any authorised agents on the island. You can also buy your ferry tickets online directly from the ferry company website (see link above). There is not much to keep you in the small fishing port of Kuala Kedah on the mainland and most people will head to the nearby city of Alor Setar (15 km). Once the boat arrives at the ferry terminal in Kuala Kedah, you can catch a public bus to Alor Setar, where you can either catch a train or bus to other parts of Malaysia or spend some time in Alor Setar. The bus from Kuala Kedah to Alor Setar leaves from just in front of the ferry terminal on the main road (through the car park). This bus then travels through the city centre of Alor Setar, before ending up at the Alor Setar bus station, Terminal Shahab Perdana, located a few kilometres outside the centre. The bus is just a cheap local type and they are all white coloured and are quite old, but they will get you to the city centre for just a couple of Ringgit. Much cheaper than taking a taxi from Kuah Jetty to Alor Setar, which will cost around 15 - 20 RM.